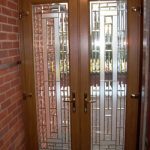 Etched glass or sandblasted glass as it is also known is the process of obscuring clear glass but leaving some areas clear, leaving a decorative design in the glass. We do not supply etch effect stickers as many companies do, we actually sandblast the glass at high pressure to permanently carve the design into the glass. 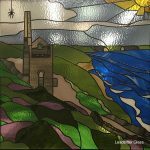 Our studio creates thousands of etched glass panels for customers each year and every order we receive is a bespoke order. There are no pre-etched panels ready to go because we create the required design in the clients exact glass sizes for every order. Clients can choose any design from our website and we can make almost all patterns chosen in any glass size. Customers can also supply their own artwork for us to create an etched glass panel featuring your own family crest or your favourite tree and you can find out what makes a suitable image here. 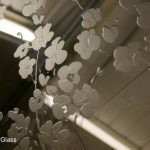 Etched Glass is one of the oldest forms of decorative glass on the market but it can also be used to create a truly modern and contemporary art glass feature. One of the great things about Etched Glass is the amount of light the glass still allows to enter the room. 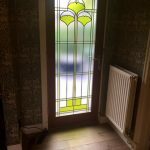 Other forms of decorative glass may have coloured sections or lead strip as part of the design and these products can tone down a small amount of the natural light. Etched glass is pure glass without any of these extra materials so the light coming through the glass is only obstructed in a minimal way. In more detail – A decorative design, a repeating pattern or even numbers and words are designed on computer software for each individual job. 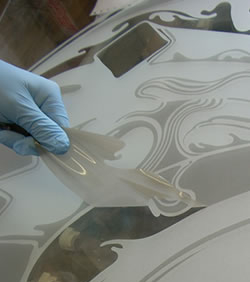 Once the layout has been created around the customers specific glass size, the design is then sent from the computer to a computer mask cutter to automatically cut out the chosen artwork. 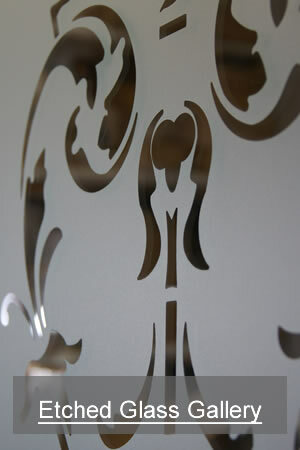 The design is then carved into a sheet of vinyl which is the laid over the whole area of the glass. By studying the design required, the areas that need to be etched are peeled away from the glass and left exposed. The glass is then placed into an automatic sandblasting machine that shoots a fine abrasive material onto the whole area of the glass panel at very high pressure. Once the sandblasting process is finished the glass is removed from the machine and the glass is cleaned down. The masked (protected) areas that were left on the glass are then carefully peeled away from the glass leaving these protected areas clear and unmarked. In this photo on the right you can see the mask being removed from the glass after blasting and you can also see the ‘blasted’ areas that appear a light grey colour. These sections are the etched areas of the glass design and once the whole mask is fully removed the clear areas and the ‘blasted’ areas come together to create a beautiful etched glass piece. 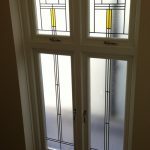 The Satin glass already comes as an almost ‘etched glass’ look and once the design is etched onto the back of the Satin glass, the design can still be clearly viewed without the presence of any clear areas in the glass panel. This panel was created for a customer that wanted a design to match with their new bathroom tiles. the client emailed a photo of their new tiles and we designed 3 options for the customer to view and this was the design they chose. The client was a little concerned about how well they would be able to see the pattern once it was etched onto the Satin glass but as you can see, the design is vivid and works well in conjunction with this privacy glass. 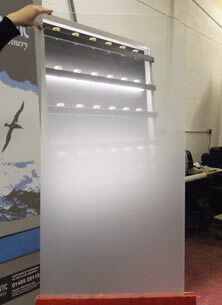 We can supply these type of etched glass panels for bathrooms in 4mm toughened glass or 6mm toughened glass. 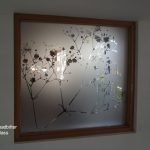 As this type off order is almost always a single glazed piece of glass, we would protect the etched areas of the design with our Sandblast Protection product which eliminates greasy finger marks appearing in the etched areas. 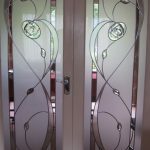 Etched glass is an ideal form of decorative glass for text and numbers on door glass and in the panels above the doors. 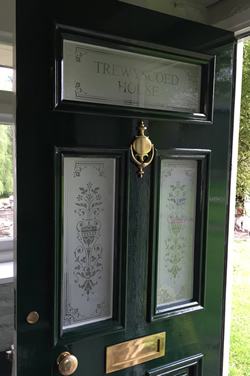 One of the most common requests that Leadbitter Glass receives is for etched numbers on or above front doors. If your home has a top light above the door, we can create a panel with your house number or name in etched glass. The panel was single glazed so again it was protected with our Sandblast Protection product. Click the Dial House image above to view examples. 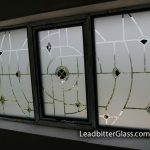 Leadbitter Glass supplies ‘Gradient Sandblasting’ or shaded sandblasting as it is otherwise known. 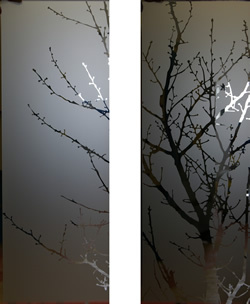 This technique gives our etched glass even more possibilities. The photo on the left shows the effect that this new technique gives and if you look at the bottom of the glass you will notice that it is fully sandblasted. As your eyes travel up the glass you can see that the glass gradually becomes almost clear. 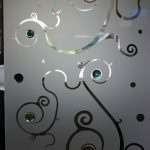 This great technique is almost impossible to create with a manual system but our studio recently added a new automatic machine especially for creating gradient sandblasted glass. Gradient sandblasting is popular for shower screens but we are limited to the size and weight of glass that we can work with so please have the glass sizes and thickness available when making an enquiry.